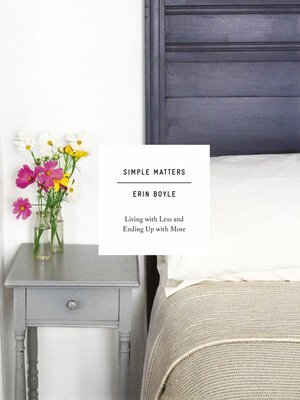 For anyone looking to declutter, organize, and simplify, author Erin Boyle shares practical guidance and personal insights on small-space living and conscious consumption. At once pragmatic and philosophical, Simple Matters is a nod to the growing consensus that living simply and purposefully is more sustainable not only for the environment, but for our own happiness and well-being, too. Boyle embraces the notion that "living small" is beneficial and accessible to us all—whether we're renting a tiny apartment or purchasing a three-story house. Filled with personal essays, projects, and helpful advice on how to be inventive and resourceful in a tight space, Simple Matters shows that living simply is about making do with less and ending up with more: more free time, more time with loved ones, more savings, and more things of beauty.